As you’d expect, the first part of the homebuilding process falls a bit on you. It’s your job to decide what your dream house looks like, and it’s your contractor or builder’s job to make that dream a reality. The first step in any home building process is coming up with an initial design. A good custom home builder will sit down with you to discuss your vision, and to make sure they understand exactly what it is you’re looking for. Once you’ve nailed down what you want your home to look like and where you plan on building it, it’s time to get the necessary permits and approvals. Your builder will submit information to building officials in your area to make sure that a variety of aspects of your new home have been well thought out. Things like your home’s site plan, HVAC design, construction plan, energy analysis, and roof loading information all have to be approved before your builder can get the go-ahead to start construction. As soon as your builder comes back with the proper permits and approvals, you’re good to go! Next, comes the excavation process. An excavation crew will work to clear your building site of trees, rocks, debris, and anything else that might stand in the way of your new home. They’ll also work to level the ground, and dig the hole for your foundation. You might be surprised at how much dirt comes out of the hole! If you have city water and sewer, this is also when the crew will tap into them and run lines to the area where they’ll hook up in your basement. After your home site has been excavated, it’s time to pour concrete. The first thing the foundation crew will do is form and pour the footings for the basement walls. They then set aluminum forms with rebar and pour the walls. After that, underground plumbing (things like floor drains and basement bathroom plumbing) takes place and then the floors are poured. Once the concrete is poured, everything has to set so that the concrete can cure. The length of curing time can vary by project and by temperature. In the winter, our crews typically let the concrete cure for at least a couple of weeks, but in the summer we can cut that back to a week in some situations. Following the completion of the curing process comes an inspection. An inspector will come out to ensure that all of the components of your foundation are up to code. After the inspector gives their stamp of approval, the building process can continue. The term framing refers to all of the major components of your home that will go up next. If you’ve seen homes being built before, this is when they start to resemble a skeleton of a house—floor systems, the wall structures and supports, and roof systems will all be completed during this stage of the building process. Your home is finally starting to look like a house! Once the bones of your house are in place, it’s time to get the more technical parts going. If you have a contractor, you’ll likely have a few crews working on the home at once, installing the plumbing, electrical systems, and your HVAC system. This is also when crews will start working on the exterior of your home. The actual roof will be put on now, as will siding and any other exterior finishes. Once the most critical components of plumbing, electrical, and HVAC systems are put in, your builders can start installing the drywall to cover up all of those wires running through the walls. Before they put the drywall in, however, they’ll have to make sure each component of your home is well-insulated. Once you’ve got insulation and drywall up, your building project will start to take on the shape you were looking for! You’ll be able to see the outlines for each of your rooms, and it’s much easier to envision yourself living here. With walls completed and exterior finishes taken care of, it’s time to make the interior of your home look beautiful too! At this point in the building process, your builder’s crew will install any and all interior finishes, from baseboards to cabinets. 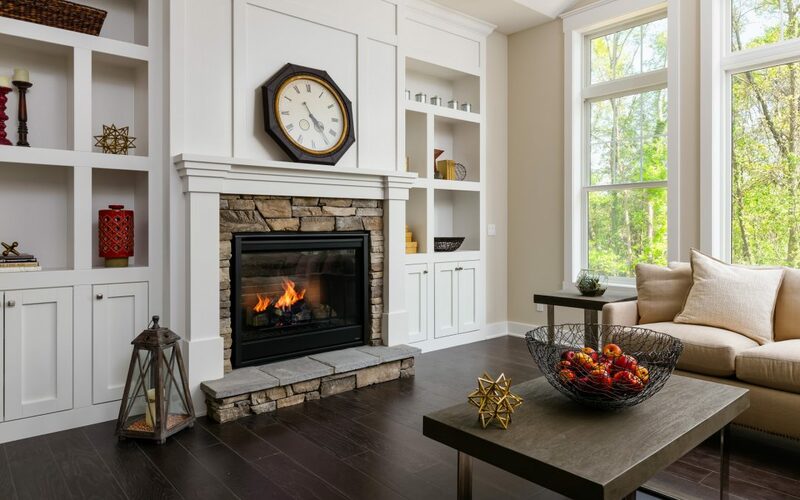 You’ll start seeing that crown molding you wanted, as well as the mantel above your fireplace. Your walls will get a finishing coat of paint, and this is also when that beautiful tile backsplash will be put up, if you’ve requested it. Once all of the big things have been installed—countertops, shower doors, carpeting, light fixtures, etc.—your builder will complete a walkthrough with you and a document called a “punchlist.” The punchlist essentially functions as a sort of checklist that helps your builder remember any minor details. Tiny features, like door handles and outlet covers, are easy to forget, which is why builders keep a punchlist of all of those things. When you walk through with your builder and his or her punchlist, be sure to mention anything you think might be missing or doesn’t look right. They can add those small tasks to the punchlist, to ensure they’re taken care of before construction can be considered complete. After everything’s taken care of on the punchlist, it’s time for your final walkthrough. This is another walkthrough with your builder where they’ll explain any warranties on appliances or fixtures, and let you know what your responsibilities are for maintenance and upkeep. This is one of your last chances to point out anything that doesn’t seem quite right, so make sure you give all countertops, corners, and stairs a good look. After the final walkthrough, your home is officially yours! You can now move in and enjoy that beautiful custom home designed to your taste. If you’ve been considering building a custom home, be sure to get in touch with the experts at Whitmore Custom Homes. We’d love to sit down with you to answer any questions you may have about the building process, or discuss your vision for your dream home. Give our office a call at 616-446-3482, or contact us online today!